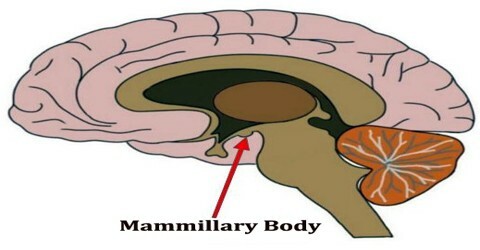 Mammillary body is one of a pair of small round bodies, located on the undersurface of the human brain, at the ends of the anterior arches of the fornix. 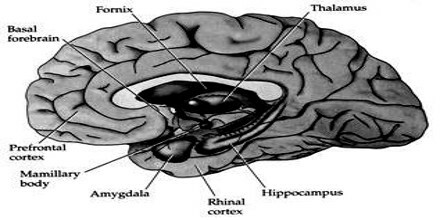 They form part of the limbic system and are often categorized as part of the hypothalamus. They consist of two groups of nuclei, the medial mammillary nuclei and the lateral mammillary nuclei. Each mammillary body joins the pretectum, thalamus, and other parts to make up the greater diencephalon part of the brain. These bodies are connected directly to the brain, and they relay impulses to the thalamus. 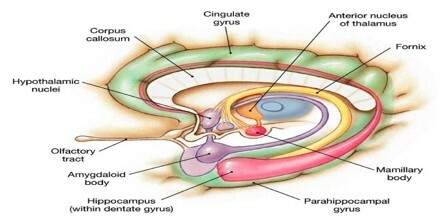 The overall route, from the amygdalae to the thalamus, is often referred to as the Papez circuit. It was previously also known as corpus albicans, but later this term became obsolete due to the degenerated corpus luteum also being called so. Each mammillary body joins the pretectum, thalamus, and other parts to make up the greater diencephalon part of the brain. These bodies are connected directly to the brain, and they relay impulses to the thalamus. Memory loss could result from damage to either mammillary body. Typically, damage results from prolonged thiamine (vitamin B1) shortages in the body. Some symptoms and complications of Wernicke-Korsakoff syndrome may also play a role. Wernicke-Korsakoff syndrome is a spectrum of brain disorders caused by thiamine deficiency. Mammillary bodies, and their projections to the anterior thalamus via the mammillothalamic tract, are important for recollective memory. The medial mammillary nucleus is mainly responsible for the spatial memory deficits that are seen in rats with mammillary body lesions. Additionally, the bodies appear to be very important in forming and recalling memories. Destruction or injury to these portions of the brain is often associated with amnesia. 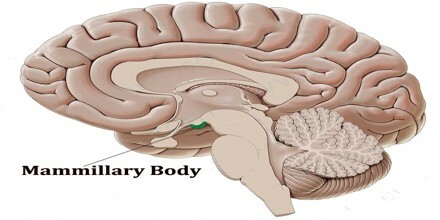 The mammillary bodies combine with the diencephalon to form a portion of the limbic system. The mammillary bodies form the terminals of the anterior arches of the fornix. They carry electrical impulses from the brain and thalamus through to the spinal cord and on to the rest of the nervous system. This explains why these structures are often associated with sensory control and movement.